It turns out that humans aren't the only ones who look good on the dance floor. Animals, researchers say, can hear and understand audible rhythms -- monkeys, apes, birds and even sea lions all move in time to the music, while others, like bonobos, can even reproduce it by drumming with sticks. 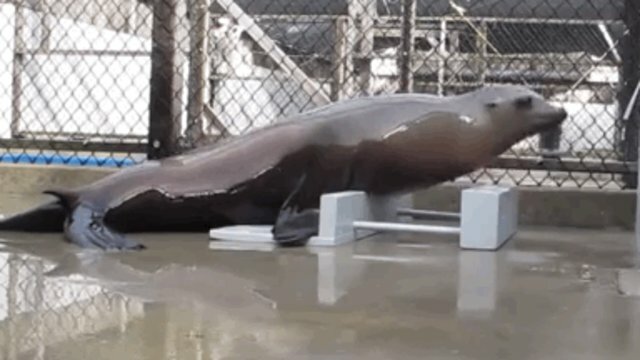 After a sea lion named Ronan was rescued by the Marine Mammal Center in Sausalito from a highway, she joined researchers and other sea lions at the Pinniped Cognition and Sensory Systems Laboratory in Santa Cruz. While the conditions in the video below don't look like the wild, it should be noted that Ronan and her companions have much more space than depicted, and receive constant enrichment and medical care. Researchers say that Ronan was an obvious choice for the project. "From my first interactions with her, it was clear that Ronan was a particularly bright sea lion," said Peter Cook, a graduate student in psychology at UC Santa Cruz and first author of the study, published in the Journal of Comparative Psychology. "Everybody in the animal cognition world, including me, was intrigued by the dancing bird studies, but I remember thinking that no one had attempted a strong effort to show beat keeping in an animal other than a parrot." But Ronan isn't the only one who can keep time, according to the research. For their next project, the scientists are scouring the rest of the animal kingdom, searching for the brain mechanisms needed for beat keeping, which they say are likely widespread.